If you have musophobia (a fear of rats and mice), look away now. Focus Home Interactive and Asobo Studio have announced A Plague Tale: Innocence has gone gold. 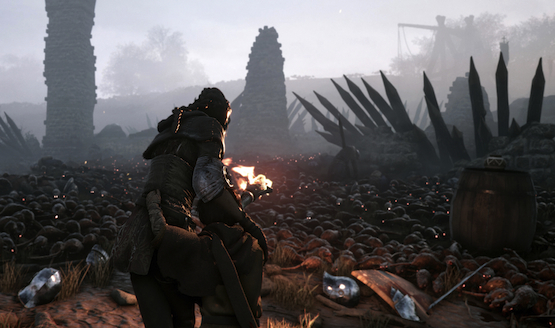 A Plague Tale: Innocence is set during the The Hundred Years’ War in 14th Century France. It explores the terrifying tale of two children, Amicia and her little brother, Hugo, who are running away from the Inquisition. However, they also face the infestation of rats plaguing the countryside and the cities of this European region. In this game, you must hide from the rats, escape from Inquisition soldiers, safely ignore the angry folk you encounter, and try to survive in order to find a safe haven. As these encounters progressively get more dangerous, the bond between the brother and sister grows. A Plague Tale: Innocence is a mix of stealth, action, and adventure mechanics with an ever present sense of danger lurking around every turn. Thousands of rats fill the screen, and the light cast by the torch offer the only safe places for the young protagonists. Chandler Wood experienced this bone chilling terror at E3 2018. He said, “While the studio could have simply and easily made some kind of looping rat-mass texture that seethes and teems across every surface, they instead landed on this much more intense and admittedly almost accidental swarm. The developers have said that up to 5,000 individual rats can be in any given scene.” You can experience these rat swarms when it launches on May 14th, 2019. Are you interested in trying out this unique horror game? Do you have a fear of rats? Let us know!